Good mortar work increases structural integrity and curbside appeal. Most basements and crawlspaces in Tennessee and Kentucky are made out of concrete blocks joined with mortar and most homes feature brick facades. Cracked bricks can be a sign of larger foundation and water penetration issues, which should be resolved first. Proper brickwork protects the integrity of any underlying repairs and restores a home’s exterior. Once the structural integrity of a home has been restored through proper foundation repair, it’s important to replace any damaged mortar using a technique called “tuckpointing” or “repointing.” Just patching over splitting walls or cracked bricks will leave a home vulnerable to water penetration. Tuckpointing involves chiseling out the existing mortar and adding new cement. Or, in worst-case scenarios, removing damaged or cracked bricks and replacing them with new, matching bricks. This not only restores the look of a foundation or façade, it also protects a home from the elements. At USS, tuckpointing is included with foundation repair and not a stand-alone service. 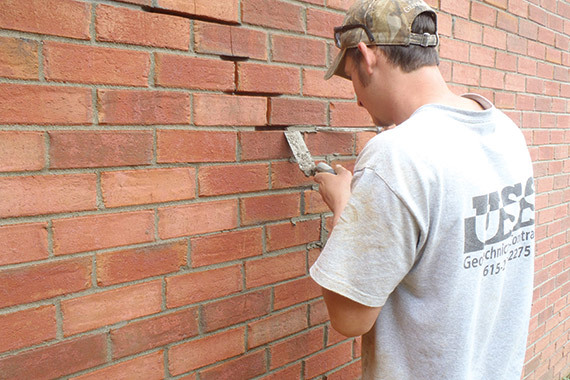 If you notice cracking or other brick issues, contact USS for a free evaluation of your home’s foundation. The lintel above a garage door is usually the longest in a house. Typically made out of metal and covered by exterior bricks, some span as many as 18 feet across. Long lintels like this are particularly vulnerable to failure over time because they have to be strong enough to properly distribute all the weight above them. Early signs of garage lintel failure include cracked bricks or cracked exterior walls above the garage opening. As the damage progresses, the lintel will start to visibly sag. Have a cracked or sagging garage doorframe? Contact us to see if you need lintel repair.